Gentrification is a term often used to describe the ever-changing Chinatown in Vancouver. This is partly due to the younger generation of Chinese-Canadians that are flocking to Richmond and other little pockets of Chinese stores and restaurants strewn throughout the Lower Mainland. So as we see condos replacing failed businesses, the demographics are shifting towards young professionals. Then it is no wonder that many of the new restaurants in the area are either non-Asian or have gone the "modern" route. Bao Bei was one of the earliest examples of this and now more recently, Sai Woo. 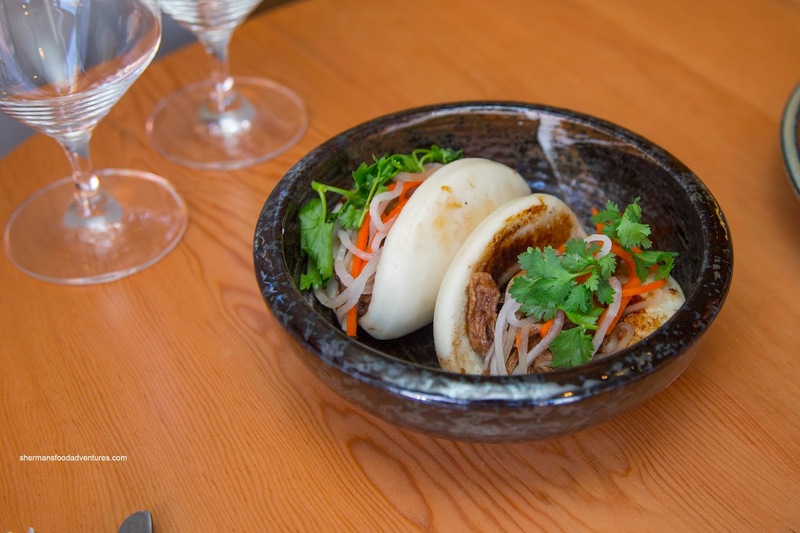 Say what you want about modern Chinese food, it is here to stay whether you like it or not. Sean and I decided to check out Sai Woo and their lunch menu. Starting with a few appies, we dug into the Cola Wings first. These were slow-braised in a sweet and salty cola marinade. Hence, the wings were full-flavoured bordering on being too salty (especially the skin). However, the meat basically fell off the bone since it had been cooked down. 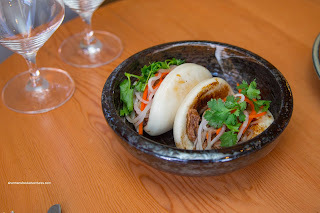 Next up were the Pork Shoulder Bao with pickled daikon and carrot, cilantro and hoisin. We enjoyed how the mantou were served hot and fluffy. Inside, the pulled pork shoulder was a little on the dry side, but it was adequately sauced with sweet hoisin. The pickled veggies added a nice acidity. 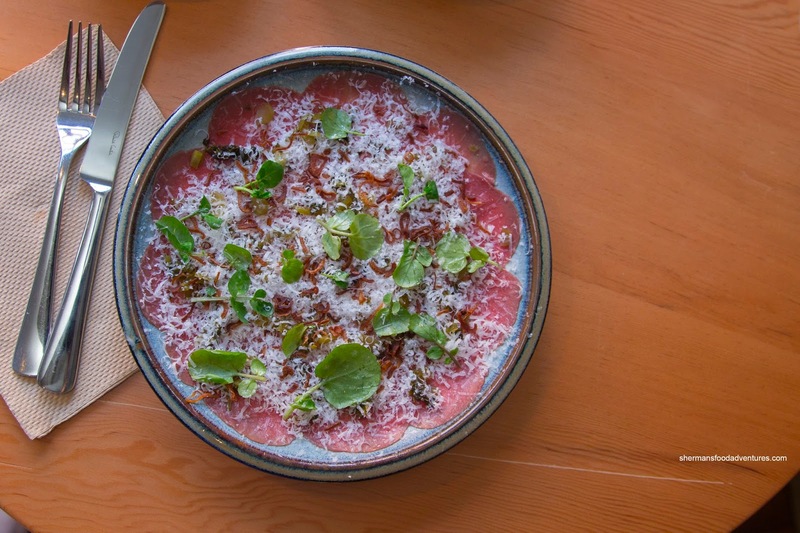 Described as a Beef Salad on the menu, our next dish ate more like a beef carpaccio with pickled mustard greens, watercress, Parmesan and fried shallots. Thinly-sliced, the beef was melt-in-my-mouth tender and fresh-tasting. On top, the fried shallots added a nice crunch and aromatics. As much as the pickled mustard greens were necessary for flavour, there was too much salt content where it overwhelmed the delicate beef. From this, we moved on to our first main being the Marco Polo Tong Mein. This was a fusion of Cantonese house made egg noodles and broth with a Taiwanese tea egg and pork belly (that can be either Japanese or North American style). 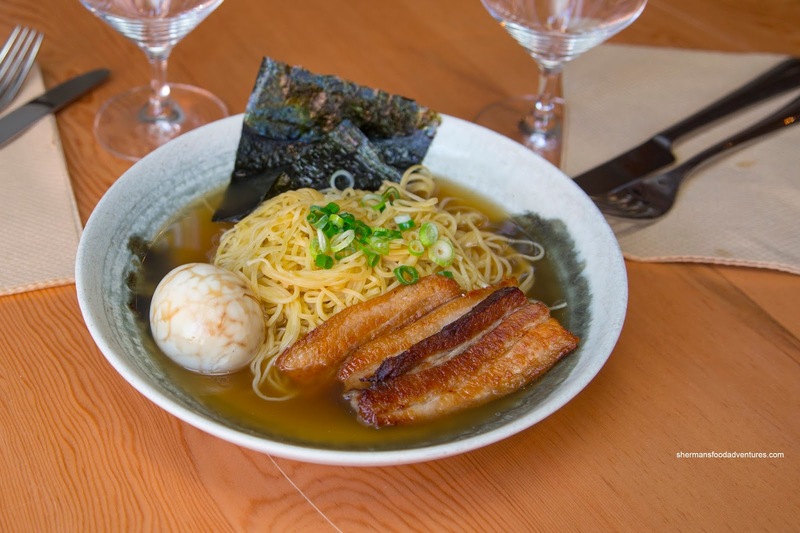 Tender and delicate, the noodles sat in a clean and mildly sweet broth. The egg was on point as it was completely runny in the middle. As for the pork belly, it was meaty while still being tender and nicely seared. 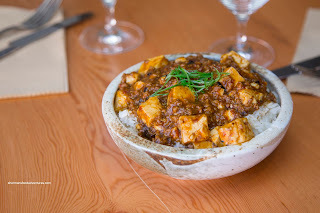 Our last item was pretty substantial in the Mapo Tofu Bowl featuring a rich ground pork sauce that was super impactful. I found that it was purposefully spicy with the tongue-numbing effect of the Szechuan peppercorns. The pork was moist and plentiful while the tofu was silky, yet maintained its shape even through the cooking process. I found the rice to be perfectly dry as it soaked up the sauce without becoming mushy. In the end, Sean and I went in with an open mind and ultimately enjoyed the meal as a whole. 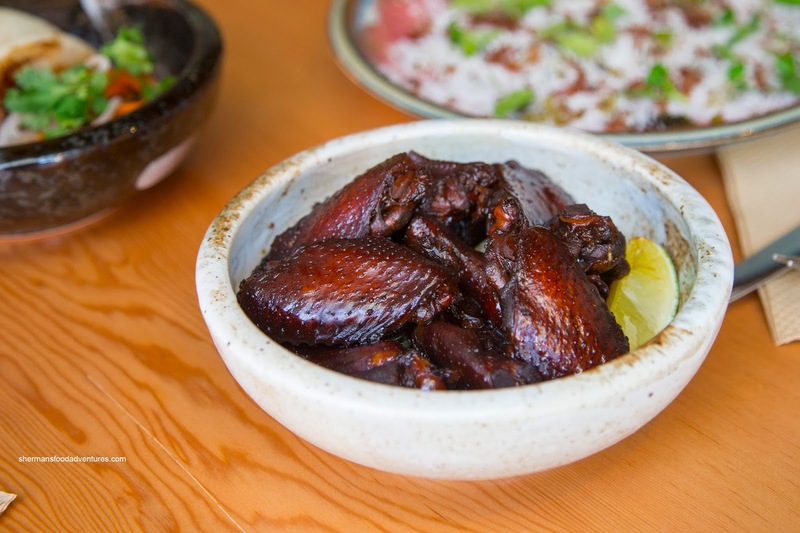 Those attempting to compare places like Sai Woo to traditional Chinese restaurant are doing so with certain expectations. 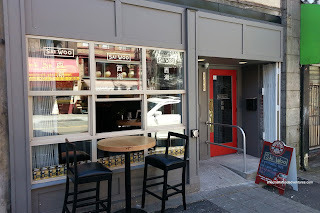 With Chinatown in transition, these types of establishments are the future.